I have a new Kindness Act I’m really excited about… Kindness Rocks! I’ve been reading about how people paint rocks and hide them for others to find for a few years now, and thought they’re a really brilliant, fun idea. I recently came across a Facebook Group called Notts Rocks, which is filled with friendly folk creating, hiding and sharing rocks they’ve painted. And I thought it’d be a great idea to write some kindness messages on rocks to hide. As I typed “Kindness Rocks” into google, I was delighted to find The Kindness Rocks Project doing the very same thing over in the US. First I needing some kit. After traipsing around to various craft shops to find some rocks big enough to paint on, I eventually bought a 20kg bag of ‘North Sea Cobbles’ from my local Garden Centre, which are ideal. I also think ‘Scottish Pebbles’ are great, but they didn’t have any in stock. Armed with new acrylic paints, paintbrushes, and my Sharpie marker pens, I got to work. After washing and drying the rocks, the first step is to paint the surface white, so you have a great canvas to paint on. Then it’s time to create. After finishing each rock, it’s advisable to seal and protect it – I used a lacquer spray, but am looking for a more environmentally friendly option. On the smaller rocks, I’m experimenting with single words, or simple designs to make others smile (I hope!). On the back, depending on how much room there is, I write: “Keep or re-hide” and “Share to #NottsRocks” to encourage the finder to take a photo and share it on the Notts Rocks Facebook Page. If there’s room, I add “♡ Helen of FB Spreading a Little Kindness”. When my nephews were here, they were happy to join in the kindness rocks spirit too. My youngest nephew loves to craft, and it was a real delight to witness his creative process. My older nephew is not really into crafts, so I was surprised and delighted that he wanted to do one too. I love his simple, yet powerful message. Now it’s time to hide my Kindness Rocks. Yippeeeeee! Yesterday I visited my favourite nature reserve to enjoy a soul soothing stroll, and took my first three Kindness Rocks to hide. It was so much fun. The first, I placed on the terrace of the cafe, the second I nestled into a tree, and the third I placed on top of a tree trunk with the most incredible talon-like roots. As I walked around the nature reserve I saw a family with a young girl, who was holding my “You are AMAZING” Kindness Rock. It was so lovely to see her still clutching it tightly in her hand as we kept passing each other along the way. Hello lovelies and Happy August! 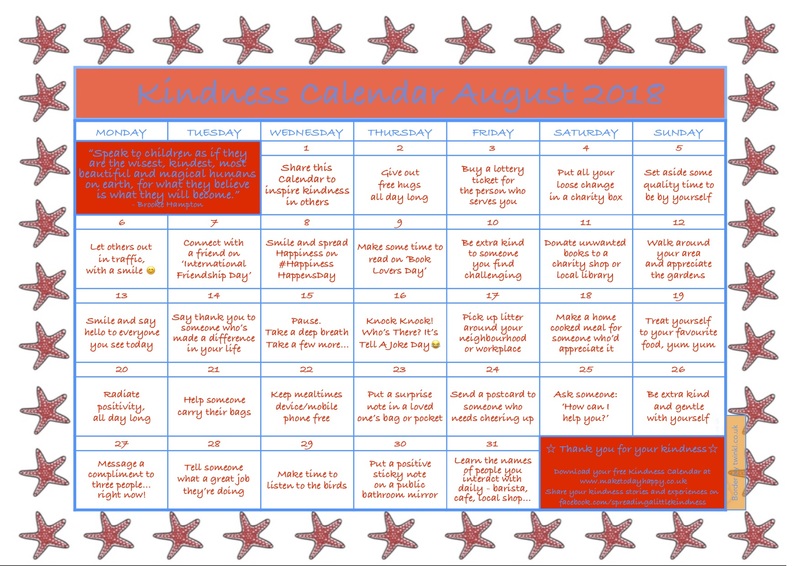 Have an Awe-inspiring August and thank you so much for spreading a little kindness.